Great hostel, I made many good friends during my stay. Loved the atmosphere! Sick hostel! 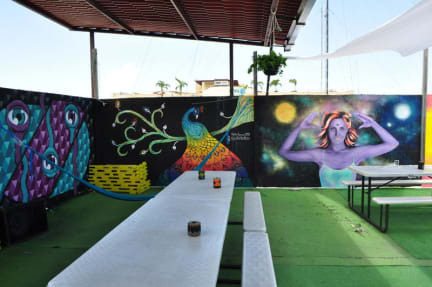 Cool vibes with all the art, great communal areas to hang out and get to know people. Yummy breakfasts that change everyday. Attracts a cool bunch of people. Would definitely book again. Hot rooms to sleep in and showers not amazing but that’s not the end of the world. Really lovely hostel with nice facilities and common areas. The staff are super nice and guests sociable. There is fresh, always different breakfast every morning. The downside are the dorms, there are really 3 x 16-bed dorms and on my bed (furthest from ac, closest to door) it was very hot and hard to sleep. Also, the doors are white and see-through so despite the curtains it was quite bright in the room when the lights were on outside. DayTripper Hostel was really cool! It has a great atmosphere, friendly staff and delicious breakfast. Facilities could be a little cleaner, but with a lot of people using them, it‘s obvious that it just gets dirty again real quick... all in all a great hostel and i‘d definitely stay there again! Lots of bugs, showers a bit cold, air con broken, WiFi a bit bad. There was a fight and a shag(fight lasted longer than the shag). But cheap, good location, good food, cute cat. Staff seemed very uninterested and the dorm wasnt great because the 'lockers' were unusable - but the curtain on the bed and having your own socket was a plus. Rooftop bar at night was great for socialising and you're able to have a lot of fun here! The hostel seemed as if it was run by kids. I went to the front desk 4 times and no one was there so I asked a girl if they knew who was on. She replied ‘me’. She was too busy painting her nails on the sofa. The rooms were dirty, bed sheets still had stains on and bathrooms weren’t clean and showers didn’t drain so water just built up which left a horrible smell. Overall it wasn’t a good stay and the breakfasts are missable. Much better places to say that are cheaper and a lot cleaner.